Camuasnagaul is a tiny hamlet of crofts a few miles along the coastal road from Dundonnell in Wester Ross, Ullapool 24 miles. 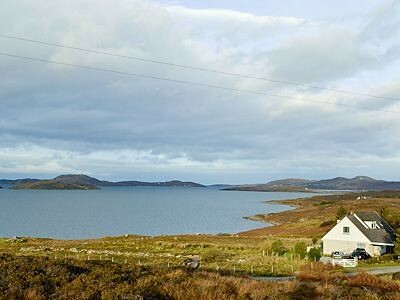 Nestling peacefully on the shore line of Loch Broom, this detached cottage enjoys an enviable position from which to view the changing tides and varying climatic changes across the mountains opposite. 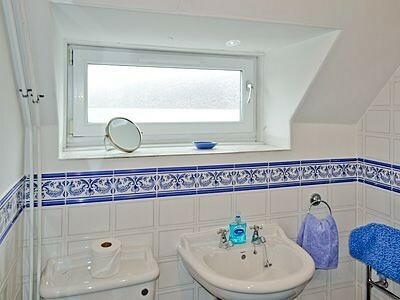 Designed and insulated ensuring a cosy holiday throughout all the Scottish seasons. An-teallach Mountain, 2 miles for climbers, hill walking, mountain biking. There is a tiny PO/shop 2 miles along the coast, (groceries can be ordered for your arrival). Shop 4 miles, pub 2 miles. All on ground floor: Living/dining room/kitchen with double sofa bed. 2 bedrooms: 1 double, 1 twin. Shower room with toilet. Elec CH, elec, bed linen and towels inc. Cot. Satellite TV. Elec cooker. M/wave. W/machine. 24 hour laundry service available. Enclosed garden. Ample parking. 1st comment: Very well designed modern cottage. Efficent user friendly kitchen. 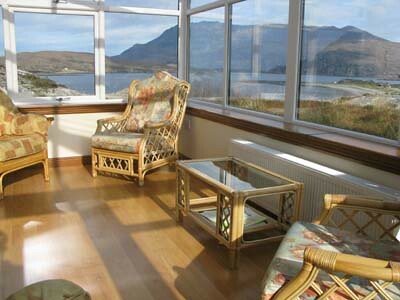 Very comfortable roomy living/dining room with views over Little Loch Broom "to die for". We will probably be back, despite the weather, which sadly was very wet while we were there this time. The proprietors, Mr & Mrs Ross were very helpful whenever we contacted them. Oct 2011. 2nd comment: The accommodation contained everything that we needed and was very clean. The location was superb - right on the sea. Mrs Ross, the owner was warm, kind and hospitable. Sept 2010. 3rd comment: Liked the proximity to the sea, lovely tea room within walking distance. Sheltered house from most winds. July 2010. 4th comment: Situation, view, wildlife and location. May 2010. 5th comment: Don’t miss a drive to Lochcarron then over to Applecross via the high road, try and pick a clear day as the views are wonderful, then via the coast road to Torridan and Loch Maree and up to Gairloch, then inverewe, maybe stopping at Inverewe Gardens if you have time, the restaurant there is always worth a visit even if you haven’t time to see the gardens. Then go home and chill out looking at the wonderful views and hopefully being amused by the antics of the seals and dolphins performing in the loch very close to the cottage. Also take your dogs on holiday with you, there are lots of safe beaches for them to scamper on and the grounds of the cottage are well fenced, our three dogs love it there. The views were superb, the owner lovely, it had a well equipped kitchen, comfortable beds and our three dogs always love it there as much as we do. Can’t find any faults with it at all. June 2009. 6th comment: Roomy and lovely views. Ideal for my dog. July 2009. 7th comment: The setting is fantastic, owners are more than helpful. March 2009. 8th comment: Excelent location for all those wanting a relaxing holiday. Walks and nearby attractions are easilly accessable. recommend getting a walking guide from the local outdoor shop. March 2008. 9th comment: We don’t want to tell anyone about this cottage in case it gets too overbooked next year when we want to go back for two weeks, but we thoroughly enjoyed the relaxing experience. June 2008. 10th comment: The cottage was gorgeous with lovely views. Very peaceful and relaxing. Would definitely go again. Aug 2008. 11th Comment A lovely warm cottage with outstanding panaoramic view over the sea loch. Owners were lovely and really friendly. Large enclosed garden for our two dogs was really useful and due to the great weather we were able to play and sit out in it too! Aug 2008. 12th Comment If you want peace and quiet with tranquil surrondings this is the place for you. Nov 2008. 13th Comment A lovely cottage well maintained to a high standard, lovely open fire just what you need after a day out in February. Owner and family very friendly and helpful. Feb 2008. 14th Comment we had a fantastic time, the scenery was superb great place to relax and enjoy the views. Dec 2007. Nestled between the mountains and the sea, lovely whitewashed house with awesome views in a truly beautiful part of scotland. Sleeps 6 in 3 bedrooms. No Dogs. No Wifi. Traditional terraced house in centre of Ullapool in Wester Ross. Sleeps six people in three bedrooms.